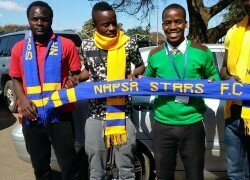 NAPSA Stars were yesterday fined K7, 000 by FAZ disciplinary committee for abandoning Week 17 match against Lumwana Radiants in the third minute of additional time last Sunday. And Lumwana were awarded three points by a 3-0 victory over NAPSA. The match which was played at Lumwana Ground was abandoned in the third minute of additional time with the score line at 1-1 after NAPSA players and officials walked off the field of play, protesting a penalty decision by referee Chilufya Mwangelwa. NAPSA said the referee was biased in his officiating because he had earlier in the match denied them a genuine goal which was ruled out for offside and denied their player handled the ball for the award of the penalty. Following the decision Lumwana Radiants have moved into 13th position on the standings with 18 points on goal difference from Mighty Mufulira Wanderers in 12th position while NAPSA drop from 13th to 15th on 17 points.